Be the first to share your favorite memory, photo or story of Harlis. This memorial page is dedicated for family, friends and future generations to celebrate the life of their loved one. Funeral services for Harlis Carnell Meylian will be held at 11:00 a.m. on Saturday, February 2, 2019, at Flactor Baptist Church with Reverends Jimmy Koonce, Wesley Jackson, Terry Ward, and Huey Haymon officiating. Burial will follow in the Flactor Cemetery under the direction of Jeane’s Funeral Service. Visitation times for the family and friends of Mr. Meylian will be held from 5:00 p.m. to 11:00 p.m. on Friday, February 1st at the church and again from 8:00 a.m. until the time of service on Saturday. Mr. Meylian was born on June 19, 1927, and passed away on January 29, 2019, at the age of 91. He was born and raised in the Hineston area and served in the U.S. Army Air Corp during World War II. For many years, he worked as a salesman and pastored at several churches including Spanish Branch, Calcasieu Baptist, Beaver Creek, Cold Springs, and Big Hammock. 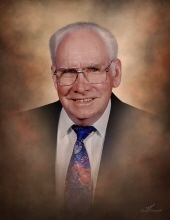 Mr. Meylian also served as an interim pastor at many churches throughout Central Louisiana. He was an outdoorsman who enjoyed fishing, running trap lines, turkey hunting and especially quail hunting. Mr. Meylian was the type of man who never seemed to have a bad day, and he never met a stranger. Preceding him in death are his wife of 67 years, Joy Marie Kirkpatrick Meylian; parents, James Alfred Meylian and Mary Jane Robinson Meylian; son, Jerry Wayne Meylian; great grandson, Alexander Johnson; and brothers, James Edward “Jaybo” Meylian and Elmer Merlin “PeeWee” Meylian. and twenty-six great grandchildren Kathryn, Jacob, Tyler, Amber, Rylee, Lydia, Ellie, Avery, Loren, Morgan, Eli, Mary Cathryn, Sara, Lindsey, Marley, Jaxon, Lilly, Tayte, Nathyn, Toby, Taylor, Hunter, Madisen, McKenzie, Maycee, and Avery. Honorary pallbearers will be Tyler Gillespie, Toby Parker, Taylor Parker, Joe Wells and Buddy Wells. To send flowers or a remembrance gift to the family of Harlis Carnell Meylian, please visit our Tribute Store. "Email Address" would like to share the life celebration of Harlis Carnell Meylian. Click on the "link" to go to share a favorite memory or leave a condolence message for the family.